We optimize our checkout process continually. To do so, we keep track of our shopping cart abandonment. Why won’t people complete their purchase, even after they have already added your products to their shopping carts? That’s what we’ll discuss in this article. Some of the reasons for shopping cart abandonment are so obvious, that you would almost forget to take these into account when optimizing your checkout process. You see, a lot of the focus on shopping cart abandonment is on why people would abandon a shopping cart, and how to prevent it. However, we think there’s one step to take into account before abandonment. Research by Close and Kukar-Kinney (2010) states that at first, it’s not about why people abandon a shopping cart. It’s about why they’re using the shopping cart in the first place! You’d think the main reason for putting products in a shopping cart is to purchase your stuff, right? That might not be entirely true. It’s actually a pretty big assumption when you think of it! Close and Kukar-Kinney actually found that a significant number of people also used the shopping cart as a sort of wish list or to simply check out the total price. The reason for the latter could be that the user, for instance, wants to check for any hidden costs you might add later on in the checkout process. Perhaps the notion of “abandonment” is an oversimplification. Some consumers may simply use shopping carts to investigate and tally possible future purchases, with no intent to purchase at the specific time that they are online. Although hard to imagine for some, shopping is not solely a functional activity for everyone. Some people just love to shop, even without buying anything. These so-called window shoppers take pleasure just in the shopping activity; regardless of them actually buying anything. In most cases, these people don’t have the budget to ever buy the stuff they’re looking at. I would expect there to be window shoppers on the internet as well. They’ll pick out stuff and put it in their baskets, without any intention to buy (all of it). Putting stuff in their baskets is just good fun for these window shoppers. Their shopping needs are met solely by filling their baskets. 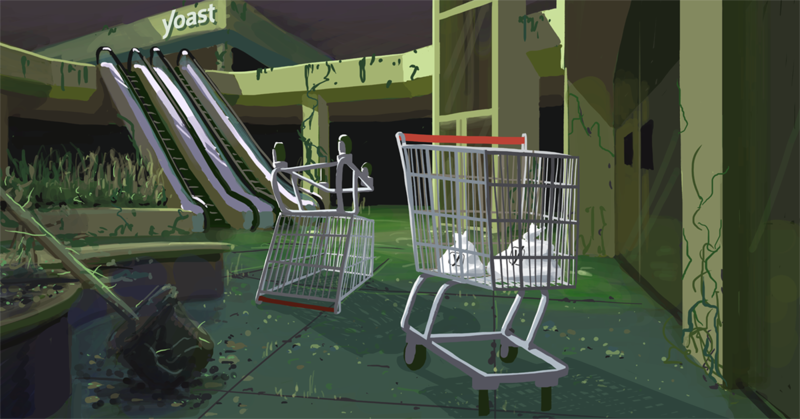 Shopping cart abandonment could thus be partly explained by online window shopping. They might just be right. 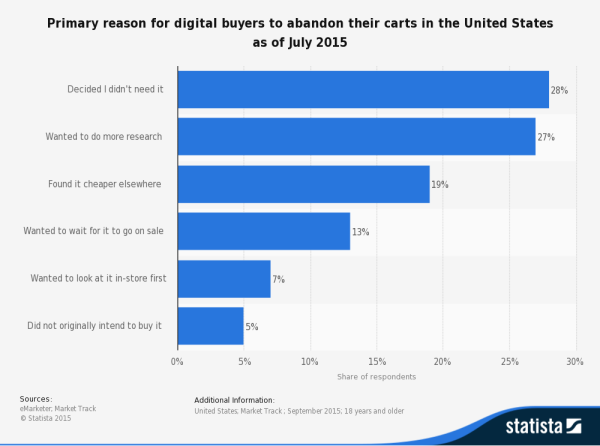 People aren’t abandoning a cart at all if they use it as a wish list. They might just be setting the cart aside and go for a nice cup of joe. Only to come back later and purchase all the things in that cart anyway. Calling it abandonment is in itself an assumption. It would be better to call it shopping cart use. Understanding how and why people use your shopping cart is quite important. On a side note: think about what this means if your session time-out is set to one hour or so. That simply means that all these people using your cart as a wish list see their wish list emptied, while they might want to buy everything this evening. Or even purchase all tomorrow. A nice reason for longer session cookie expiration times, right? It’s not an easy job to find out why people are abandoning your shopping cart, let alone how people are using your shopping cart. That doesn’t mean it’s impossible to do. When we first published this article in 2014, we mentioned that it would be great if more companies would try to be of assistance in this. Every customer is different; perhaps that’s what makes this very complicated. But that’s just me thinking out loud. Up to today, it’s mostly reading or doing studies and funneling/enhanced eCommerce in Google Analytics that will give you some insights. Enhanced eCommerce will tell you at which point people abandon your cart and with what product in that cart. There is some filtering that can be done here as well; it might be worth your while to dig into this, actually. It will also pay off to simply ask your visitors why they abandon your website. That can be done by e.g. creating a so-called exit intent survey. That survey will only pop up if a visitor is moving his cursor to close the window. If you ask people at this point in time why they’re leaving, it could give you some very useful insights. Baymard Institute has compiled 24 different studies and found that the average shopping cart abandonment is a whopping 68.63% (January 14, 2016). That’s a lot. It shows that you want to be sure you’ve looked at it from every possible angle. This chart by Statista shows that people browse eCommerce sites and simply add products to the cart just to be able to decide later if it’s worth buying. As always, you need to be aware that methods of doing such research, especially in surveys, can lead to some discrepancies. A 2014 study by comScore showed that “not being ready to purchase” or “saving the items for later” were the biggest factors. I can totally see that being true today as well. It aligns with the ‘wanted to wait for it to go on sale’ in the Statista chart as well. I like the fourth one a lot. Especially when surfing a website on a mobile device, interruption is always a factor. I totally agree with that last one as well: keep on testing, monitoring and improving. Find more details in the article by Ventureburn itself: 7 reasons why customers are abandoning your mobile shopping cart. Being clear about your prices and additional costs is just one of the things we mentioned as an improvement for your checkout page or shopping cart. There are many things you can do to keep people from abandoning or ‘misusing’ your shopping cart. After reading this post, one of them must seem quite obvious: offer people the wish list we mentioned earlier. Amazon is the obvious example for this. It’s an effective way to reduce the ‘noise’ in your statistics from alternate uses of your shopping carts. Clearly state any additional (f.i. shipping) costs. Clearly state your payment options. Clearly state the number of steps in your checkout process. What about your shopping cart? Do you monitor abandonment? Do you already provide that wish list? Or does that make no sense at all for your website? I trust this post will give you some food for thought for your own website!